Now that you have your supplies gathered, we are ready to start making a pillow! All of these instructions are written to create an envelope style cover to put over a pillow form. 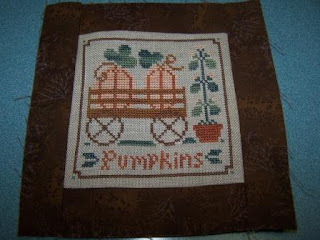 However, if you only want to make a small pillow, you could leave off the large border. If you want to stuff your pillow instead of using a pillow form, you would make a one piece back and leave an opening to turn and stuff your piece. The basic principles are the same, so you should be able to modify to suit your needs. Personally, I do like to make the envelope style pillows and use a pillow form. This eliminates storing bulky pillows, and allows me to switch out the covers with the seasons. The first thing that you need to do is draw out your dimensions. I strongly suggest that you don't skip this step if you are planning to use a pillow form! (Even though I drew mine out, I still messed up...hence the delay in getting this posted...and an unplanned extra border around the edge). You will need to decide how big your finished pillow should be. That will drive all of the other measurements. I used 0.25" seam allowances throughout this project. I used a 14" pillow form, so the size of my front piece needed to be 14.5" x 14.5", which is the 14" finished size plus 0.25" seam allowances all around (to allow for attachment of the back panel). Section A - Stitched Design Area: My stitched design size was 4.0" x 4.0". I wanted to leave a 0.25" margin around my stitching. 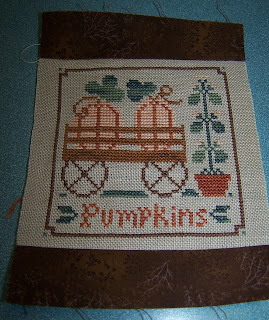 I allowed 4.5" x 4.5" for the design portion (4.0" stitched area + 0.25" margin on each side). The cut area needs to be 5.0" x 5.0" to allow for the above finished size, plus a 0.25" seam allowance on all sides to attach to Section B. 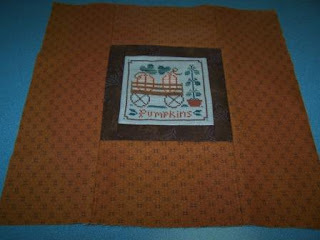 Section B - Narrow Border Area: I wanted to have a 1.0" border all around the stitched area. 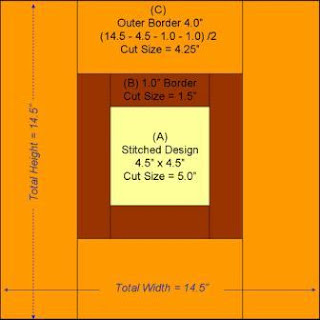 The cut size of the strips for this area needed to be 1.5", which is the 1.0" finished size, plus a 0.25" seam allowance to attach to Section A and 0.25" seam allowance to attach to Section C.
Section C - Wide Border Area: This area is flexible based upon the finished size. The total width and height of the front needs to be 14.5" as discussed earlier. This measurement includes the 0.25" seam allowance on each side to attach to the back. The finished size of this area will be 14.5" total minus 4.5" (A) minus 2.0" (B on two sides) divided by two (top, bottom) = 4.0". The cut size for the strips in this section needed to be 4.25". This is for the 4.0" size just calculated, plus 0.25" to attach to Section B. The seam allowance to attach to the back was already taken into consideration when calculating the 14.5" total size of the front. Hopefully that all makes sense. Draw yourself a diagram, and calculate carefully. Be sure to do your finished size calculation first, and then do the cut size calculations. Now that you have your diagram finalized, it's time to get down to work. First, we'll cut the stitched piece to the correct size. I like to do this by pulling threads to make a visible cutting line. This ensures that you are starting with a nice, straight edge. Measure 0.5" from the top edge of the stitching. The 0.5" is for the 0.25" border, plus the 0.25" seam allowance. Pull out the horizontal thread closest to 0.5". You could also count threads rather than measuring. 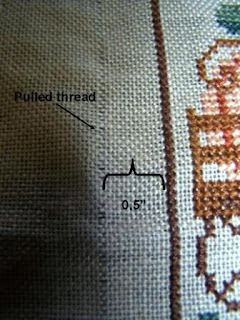 For example, if you stitched your piece on 28 count, you would count out 14 threads and pull out the 15th thread. Repeat all around the piece. Cut out your piece using space left by the pulled threads as a guide. Cut your strip of fabric for Section B, using the cut size width that you calculated for this section. Don't worry about the length. When I cut my stips, I just cut the appropriate width of fabric and for the length I went from selvage to selvage. One strip was plenty. Cut your strip of fabric for Section C, using the appropriate width that you calculated for this section. Again, cutting from selvage to selvage gave me plenty of length. Iron your stitched piece and your strips of fabric. The good news is that the hard part is over, and we're ready to sew! 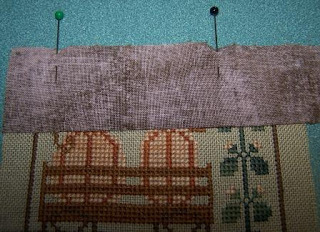 Start at the top of your stitched piece. 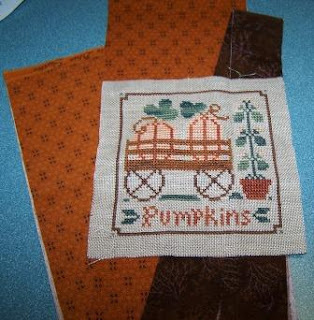 Pin the right side of your Section B strip to the right side of your stitched piece. 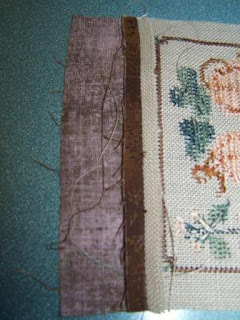 Cut off any excess length even with the edge of the stitched piece. 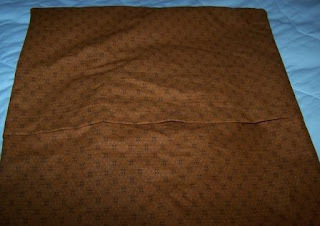 Sew a 0.25" seam. Repeat at the bottom edge of your stitched piece. Iron the seams open. Attach the Section B strips to the sides. Iron your seams open. Important! Measure your piece, and make sure that it is somewhat close to what you calculated. I messed mine up, because I had forgotten about the seam allowance to attach the front to the back. 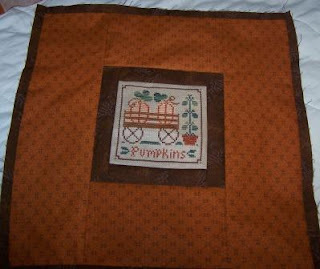 I had to sew a little strip all of the way around, so in the following pictures you will see an extra brown border. I wasn't thrilled about this, but it turned out okay. Now is the time to make any corrections, if you miscalculated. Cut your back pieces. You will need two pieces. The width should be the same as your front. The length should be about 70% of your front. Hem one edge of each of the back pieces. 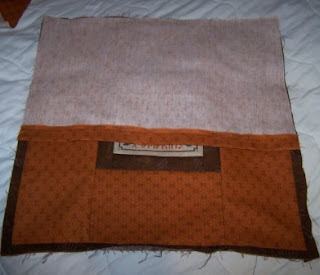 I like to use the selvage edges for this, and fold up about an inch and sew it down. If you don't have a selvage edge to work with, you will need to do a double fold and sew it down. Lay your front piece face up. Lay one of your back pieces face down on top of your front piece. Line up the unfinished edge of the back piece with the top of your front piece. 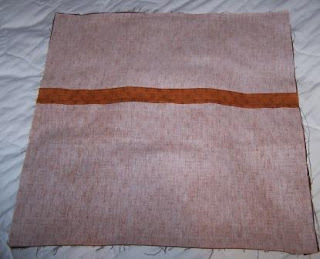 The hemmed edge should be towards the middle of the piece. Pin. Lay the other back piece on top of your front piece, lining up the unfinished edge with the bottom of the front piece. 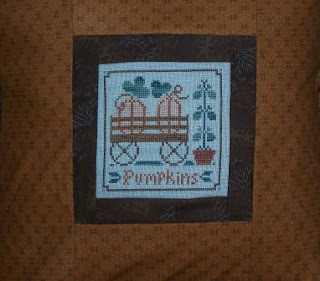 Your two backing pieces will overlap. Pin. Sew all of the way around the piece, using a 0.25" seam allowance. Insert your pillow form into the "envelope" opening in the back. Stand back, pat yourself on the back, and admire your finished pillow! Great tutorial! I've scheduled a link to this post to go live on my blog Sunday morning (Central USA time), December 21. I hope it brings you a few extra clicks.